The popularity of tanzanite, with its aurora of stunning blues and violets, is well deserved. Demand for it has rocketed in recent years, outstripping sales of all other colored gemstones-with the exception of sapphire. A thousand times rarer than diamond, and with a little over a decade of mine life remaining, tanzanite is the fashion gem of the millennium. A key ingredient to tanzanite's success is that it exhibits more shades of blue than a clear midnight sky, due to a phenomenon called pleochroism, whereby different colors are seen in different directions of the gemstone. Zircon's name is either derived from the Arabic word zarkun, meaning "red," or a combination of the ancient Persian words zar, meaning "gold," and gun, meaning "color." 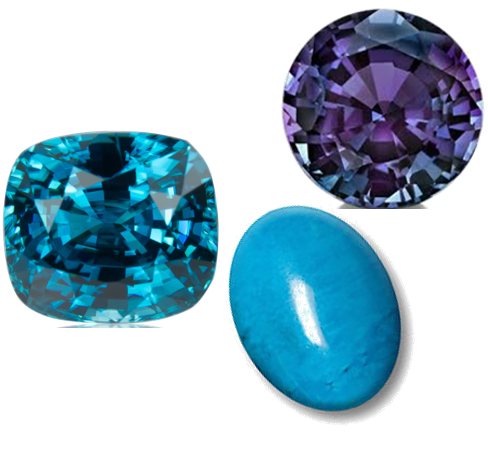 Despite this name, zircon actually occurs in a myriad of colors. Although zircon's existence predates cubic zirconia by centuries, zircon is often unfairly confused with cubic zirconia, a cheap, man-made diamond substitute. ZWhile zircon may also be used as a diamond substitute, it is valuable in its own right. The name turquoise is derived from the French pierre turquois, meaning "Turkish Stone." This is because western Europeans mistakenly thought the gem came from Turkey. Turquoise, a hydrated phosphate of copper and aluminum, is prized as a gemstone whose intense blue color is often mottled with veins of brown limonite or black manganese oxide (commonly known as spider's web turquoise). It is almost always opaque and polished as cabochons, but rare, translucent gems also exist.